Boxers are instictively den animals. In your home, your boxer's crate is his "den". It's their own space, which gives them a sense of security. Eventually, your boxer will be happy to spend time there as needed. 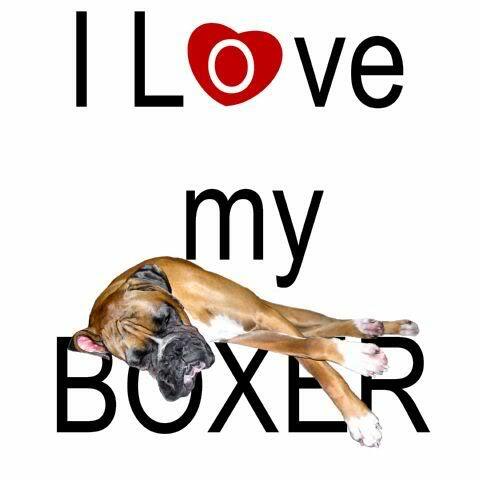 Your boxer should be encouraged to sleep and rest in his "den". You also need to respect his or her privacy. This is their room and when they go to their room, they need to know they can use it for some alone time- much like your kids in their rooms- to take a break from everything and each other. Our boxers make a game out of checking out each others' crates. You never know when someone has stashed a treat until later. Kuni especially likes to take naps in different crates, as Goldilocks tried out the different beds to see which one suits her. It is especially fun to watch them walk up to the crate door and use their paw and nails, much like our fingers to open the door and walk in, and if they aren't into company, close it again behind them. We also use our crates to feed our pets. It makes it easier to keep track of who is eating well or being a little finicky and needs a change in menu. It also keeps the mess to a minimum, in case a bowl is accidentally knocked over. Tell them it is time to eat and they head right for their crate- occasionally they trade off, but it is always with mutual agreement. Crate training may take a little time and patience. Keep the crate in an area of the house where the family spends a lot of time. Toss a small treat, such as the boxer cookies (see the recipe section of this site) into the back of the crate. Praise your boxer as they enter the crate. Leave your boxer in the crate for short periods of time at first. Increase the amount of time as they become more secure. Being in the crate should be a pleasant experience. NEVER use the crate for punishment!! Crates are a helpful tool used in housebreaking. 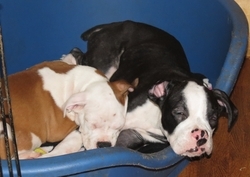 A puppy instinctively knows not to "mess" in his crate, but does need to go out every 3-4 hours when young. Take frequent "breaks" and try to get on a schedule.....like first thing in the morning when getting up,after meals, after exercise, after a break in the routine (like an guest that is strange to him, and last thing at night before bedtime. Crate training can also be helpful in avoiding "unwanted behavior", such as chewing and digging, due to boredom or anxiety. Besides restricting access to "off-limits" areas of the house, the crate can have a calming effect when introduced correctly. Your boxer will be safe as will your belongings. Leave an approved chew toy in the crate with them to satisfy the need to chew. Most of our crew like the molded plastic crates that are closed in, however, we do use some of the wire crates for the mom with their babies for easier checking and quick access. If you decide on the wire crate, a fitted twin sheet placed from one side to the other is much more inexpensive than the purchased covers. They work just as well, and is less of a loss if your boxer decides to pull it through the slats and teethe on it.